All aboard! Hop on the Georgetown Loop Railroad and Mine Tour to travel back in time on one of the state's best narrow gauge railroads for an experience you won't forget. 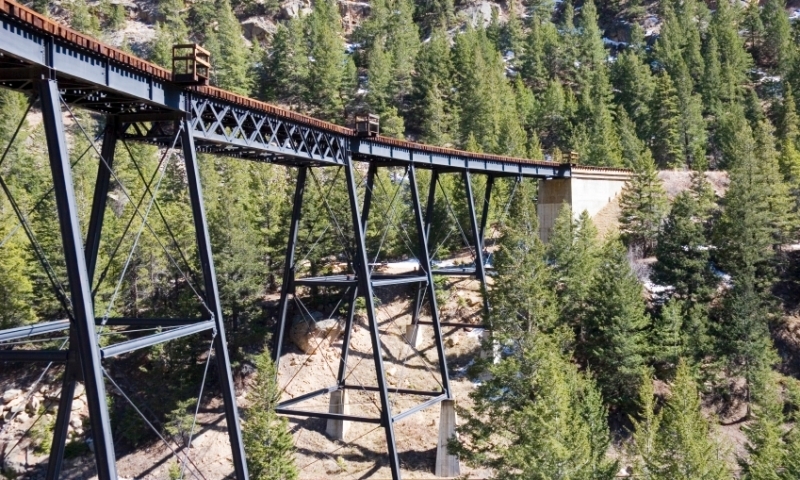 Three-foot narrow gauge railroad connects Georgetown and Silver Plume. The classic steam or diesel locomotives gain 640 ft. in elevation over four bridges and 3.1 miles of track. The Devil's Gate High Bridge is a spectacular crossing over Clear Creek. Daily schedules in the summer and regular weekend service in the winter. Though the towns of Georgetown and Silver Plume lay only two miles apart, the road between them was an engineering hurdle finally tackled in 1884 with a three-foot narrow gauge railroad. This corkscrew route covers twice the distance and gains 640 feet in elevation using grades of up to 4%. Take the time to walk 500 ft. into the Lebanon Silver Mine through a tunnel dug in the 1870s. It's a great chance to put on a hard hat and listen to a guide point out the silver veins, all the while explaining the details of a gold rush era mine. Georgetown Loop Historic Mining & Railroad Park has a number of buildings to visit while you're waiting for the train to depart. A depot from 1884, an old mill and the Pohle house are just some of the options available. Arrive in Georgetown with some time to spare so you can enjoy the restaurants, shops and recreational opportunities. Fantastic shopping can be found on Sixth Street in the National Historic Landmark District. Located just 45 miles west of Denver on I-70, the Georgetown Loop Train can be boarded at Devil's Gate Station in Georgetown. Take exit #228 from I-70, taking a right at the visitor's center and following the signs to Loop Drive. Another option is boarding the Georgetown Colorado Train at the Silver Plume Depot, off exit #226 on I-70. For more information, call (888) 456-6777. The Summer season is late May to mid October, with the Fall and Winter operations continuing with weekend and special service. Devil’s Gate Station in Georgetown opens at 9:30 AM. Run on the weekends and special operations, please check with Georgetown Railroad for schedule and fares. Tickets may be reserved in advance by calling 1-888-456-6777 or purchased onsite if space is available.